Not quite jewellery, but close. I managed to roll over in bed and remove the nose piece from my titanium frame specs. Optician tells me they send to qld for soldering, cost 65, but I only paid half that for the frames. Is a home repair feasible?. I have tig, or soft solder. Or I could glue - super glue or a uv setting resin. 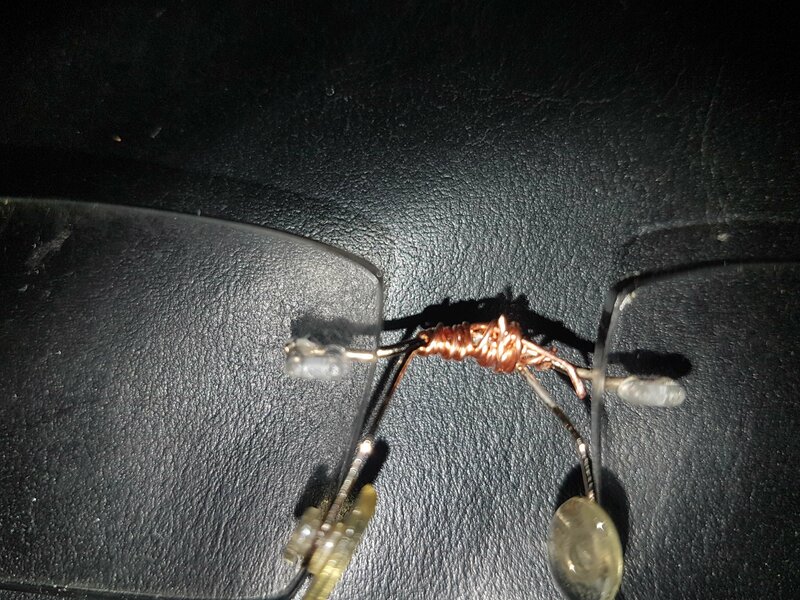 Probably a neat wire wrap and a touch of soft solder would do the trick. At least while I get new frames. Very first example is leg of glasses rather than nose but principle seems the same. Cheap enough to buy it and have a go, I got some at ALdi for $10 a while ago. Is it possible to make a jig or a cradle of some sort to ensure no twist when you glue it ? Don't want the lenses pointing in different directions. You could leave the wire on, get the lenses positioned right then simply use the bondic to stiffen and cement the wire to the frame - can be buiolt up in multiple passes. Would possibly look ugly but be quite functional ? Actually I do have that glue, or a copy of it..
Fortunately the bridge between lenses is intact, this is just the nose piece. But I suspect the joint will be fragile so I do need to align it carefully. I wonder if I can find gold (plated) wire. If I can wrap it neatly (if) it might almost look like a feature.. I do wonder if soft solder would take. Gold plating on electronic components takes solder well.